Take a tour of the property. Open year-round, the Highland Center offers a variety of accommodation options, including private rooms with private bath, private family rooms with hallway bath, and private and shared bunkrooms with hallway baths, as well as 16 bunks in the nearby Shapleigh Bunkhouse. Towels, linens, shampoo, and soap are provided to all guests. Dinner and breakfast are included in most room packages, as well as trail lunches for guests who place their order the night before pickup. Guests can also enjoy free borrowing privileges at our L.L.Bean Gear Room and a wide variety of free, walk-on programs, from guided day hikes to evening talks on astronomy and other topics. The lodge is wheelchair-accessible, including all meeting rooms, the dining hall, and some guest rooms with bathrooms by elevator. Dinner and breakfast are included in most room packages. Join us for Social Hour at 5pm on Saturdays year-round and daily throughout the summer. Put your feet up and enjoy the Highland Center’s comfortable living room with cozy fireplace, or relax on our beautiful patio with views of Crawford Notch. Guest can also make use of our Library, Hiker Shuttle to nearby trailheads (summer and fall), new Electric Vehicle (EV) Charging Station, and Wi-Fi Service. Kids will love our natural, outdoor “Big Mountain” Playscape, where young explorers can climb a trail, crawl through a rock cave, traverse a rope bridge, and jump across stumps, all just steps from the Highland Center’s back door. Forgot an important piece of gear, or want to try one out before buying? Highland Center guests have free use of the L.L.Bean Gear Room, where they can borrow everything from boots and packs to layers and snowshoes. The retail store offers books, maps, AMC apparel, gear, USFS parking passes, and last minute items, and the friendly staff are always available to assist with weather, trail conditions, and other information. In addition to the included meal service and features above, the Highland Center also offers a full schedule of complimentary programming, including guided day hikes to nearby scenic destinations, instructional talks on outdoor skills or natural history, and in-depth evening programs featuring films and guest speakers, presenting on topics from Astronomy to Winter Hiking. The Macomber Family Information Center, open during the summer and fall, is located in the historic Crawford Depot, a former train station renovated by the AMC, and houses interpretive displays, an information desk, and a small gift shop that stocks last-minute hiker supplies, guidebooks, and souvenir items. Staff and volunteers provide information services and offer periodic talks on Crawford Notch in coordination with an excursion train that runs on the rail line during the tourist season. We are not able to accommodate pets at the Highland Center. Please ask for our list of local kennels. Please be respectful of other guests and observe quiet hours from 10:00 PM to 7:00 AM. Beer and wine are available during meal times at the Highland Center. State law requires that any personal alcoholic beverages be consumed only in the guest’s private guest room, and be consumed in a responsible manner. With an extensive trail network at its front door, waterfalls, lakes, and more, the Highland Center is the perfect base for your outdoor adventures. Explore on your own, or join us for free daily programs and guided outdoor adventures. 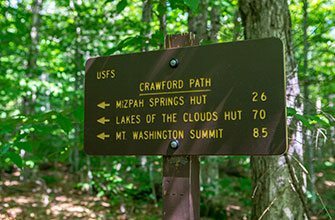 Follow historic footsteps as you climb to the summit of nearby Mount Willard for one of the most legendary views in the White Mountains. Nestled in scenic Crawford Notch, it’s the ideal base camp for adventures. Hike a 4000-footer or take a more relaxing route. Take in the wildflowers and crisp mountain air as you sip a beer on the patio while the kids play on our Big Mountain Playscape. Our Highland Center adventure guides offer free programs including short hikes and nature walks, talks about local flora and fauna, and evening speakers and movies. View a sample schedule.